Emergency! This is the result of the questionnaire given amongst the members. Junsu: This is the type of song that has a catchy melody that will stick in your head. 2PM has recently released their new single, “I’m your man” after their first single “Take Off” in May. It is a song that talks about protecting their special woman and perfectly fits their “beastly” image. Wooyoung: Because we’ve recorded this in the middle of our hectic schedule, we’re very worried whether we’ve done well or not. On stage, those worries were completely blown away by the cheering that they’ve received. Following the “airplane dance” they’ve shown us in their first single, this time they’ve challenged the “necktie dance”! Junho: This is the first time we’ve experimented with including items in our performance. Nichkhun: This also the first time that 2PM wore suits. What do you think? 2PM: A lot of meaning was put into the necktie that appeared in the music video. For example, in the scene when Taecyeon takes off the necktie that was covering the woman’s eye. The message we want to send is that we want to rescue everyone out of this dark and scary world. Please certainly check out this song that is full of our feeling. By the way, in what kind of situation does everyone feel that he wants to “protect” his woman like what is said in the lyrics? 2PM: When we are able to meet with our fans that always come to support us with all they have! We are always especially moved when they are cheering for us passionately during our live performance. Everyone that has been cheering for them must feel very energized after hearing these words from them. In connection to the new song “I’m your man”, what kind of guy are you? (Junsu’s handwriting) I’m the kind of guy that has a passionate heart and a cool head. Please give a message to the fans. (Junsu’s handwriting) I’m your man. I will always be your side and will burn you up. Q. As of late, what makes you feel happy? A. The time when I was recording my self-composed song, “Hot”. Q. When you wake up in the morning what is the first thing you do? A. I rub my eyes. Q. What do you like about your room? A. My bed. (Fiddles) At last, the bunk bed was replaced with a single bed. Q. If you’re suddenly told, “You’re free tomorrow!” what are you going to do? A. Just the thought of it makes me happy….. Our schedules are always packed so I think I would love to visit my parents in Daegu. Q. If you are going on a date, where do you want to go? Q. How will you be when you are in love? A. I will become very childish like a kid. Q. What is your treasured item? A. The fan letters that I’ve collected until now. Q. The person you are close to? (Nichkhun’s handwriting) A serious man. When it comes to work I’m very serious and I want to make it perfect. (Nichkhun’s handwriting) Please give lots of love to this single, “I’m your man”. I’m always wishing for everyone’s good health. A. When we did our live performance at the “2011 Fireworks Display in the Outer Garden of Meiji Shrine Convention ~Fireworks that will Heal Japan~”. Q. What have surprised you lately? A. The fans reaction towards “I’m your man” is really good. A. A tank top and a pair of shorts. A. Get lots of sleep, exercise, meet friends, and eat delicious food. A. I’m the type of guy that is very dedicated to his girlfriend. Q. Who are you close with? (Taecyeon’s handwriting) A passionate man. I always do everything passionately. (Taecyeon’s handwriting) Please give lots of love to 2PM and please listen to “I’m your man” a lot! A. When I wake up in the morning and being able spend the day with someone without any hurry while drinking milk and eating sponge cake. Q. What are you into as of late? A. I’m hooked on iPad games. Q. What about the mistakes that you did recently? A. If it’s about mistakes then it’s during the “2011 Fireworks Display in the Outer Garden of Meiji Shrine Convention ~Fireworks that will Heal Japan~”. No sound came out from the microphone during our performance. It was unfortunate for us. Q. What do you where when you sleep? A. Exercise, shopping, and go to the movies. A. I want us to go and ride bicycles together. A. A Mickey Mouse stuffed doll that my mother gave me as a present during first grade. Q. Who are you close to? A. The fact that the drama I’ve appeared in, “Dream High” is being broadcasted in Japan. A. When I went to the gym and it was closed. A. My bed that I could sleep comfortably in. A. I will do nothing but sleep. A. A panda stuffed doll. (Junho’s handwriting) A passionate guy. Whether it’s love or work, I’m passionate in everything. (Junho’s handwriting) Please love “I’m your man”. A. Writing lyrics, composing music. A. Look at the clock! A. A pair of shorts. A. Actually, it’s not that pleasant, I want to clean it up someday. A. I want to go play on jet ski's with someone I get along well with! A. I want to try and have a normal date in the city. Can I do that? A. I will be in a trance. A. If you’re talking about an artist, it’s J. Y. Park-san. (Chansung’s handwriting) Chansung is the kind of guy will definitely do a background check. Because I’m a gentle guy and the more I know about her the more I want to know……?!?! Hahaha…. A. When I read my novel, when I listen to music, when I play… games and play with my iPad. A. When I went to the gym on Sunday and it was closed so I didn’t get to do any training. A. Just my underpants. Or just my pajama pants only. Q. What do you like about your bedroom? A. The fact that it’s big. A. A place where there’s no people and the scenery is good! A. I will be happy all day long. A. The people around me. Q. What about your rival? 2PM had the chance to greet V6 in their waiting room at Music Station. Innoji (Inohara Yoshihiko) introduced himself and made a gesture. 2PM saw it and laughed. Ken (Miyake Ken) said "Everybody is so tall. Your view of the world is probably very different from ours." Okado (Okada Junichi) said "They should cut their legs from their knees off." And during the talk portion of their concert, V6 talked about 2PM and a member of V6 said "2PM came to greet us in our waiting room today. Innoji made a joke for them too and everybody laughed. Everybody said that 2PM are very nice and very tall...they really should share some of their height with us too." The best variety-dol will be revealed in group 2PM. Undisclosed videos from cable channel SBS E!TV '2PM Show' will be revealed. In the x-file videos viewers will able to see the birth background of '2PM Show' to the behind story with the Moon Mason brothers which will bring enjoyment. At this, 2PM members stated "We worked so hard for broadcast but it was disappointing to see that parts were cut out" and showed their happiness with this upcoming episode of the undisclosed videos. You will be able to meet 2PM's explosive variety talents next month on the 3rd. On September 3 on the cable station SBS E!TV’s 2PM Show, the parts that were cut out during editing of the shootings, and behind the scene stories from episode one to eight will be revealed to fans. The story of how 2PM Show launched, parts which were cut out due to editing in the Moon Mason episode, various behind-the-scene stories of the members, game simulation and many more are to be shown. The 2PM Show behind the scene stories will air on September 3 at 11:00 p.m. on SBS Plus and on September 4 at noon on SBS E!TV. Hello! Many of you have been wondering about this show segment with Hong Seokcheon, so we have translated that part of the video for you. We feel it's better to see it rather than read an article. The woman you wouldn’t want to be friends with the most? MC: So, today who is ranking them? MC: woman you wouldn’t want to be friends with, so first place is a bad thing right? So today there is a penalty for first place. MC: Just for today, being first is bad. MC: HSC have you ever had your offer of friendship turned down? HSC: Rather than friends, I’ve asked for a close hyung-dongsaeng (close older male-younger male) relationship but was turned down by 2pm’s Junho. MC: Junho is a someone with really small eyes…when he smiles very, like this..
ASY: He had a boyfriend in the past who resembled Junho a bit. HSC: Ah also, Junho ssi, women also think so, he has a very charming face. On the 26th, 2PM gave a performance of “I’m Your Man” on Asahi’s Music Station in Japan. Music Station is the oldest music program in Japan since 1986, and it airs on the prime time slot. 2PM’s “I’m Your Man” has ranked no. 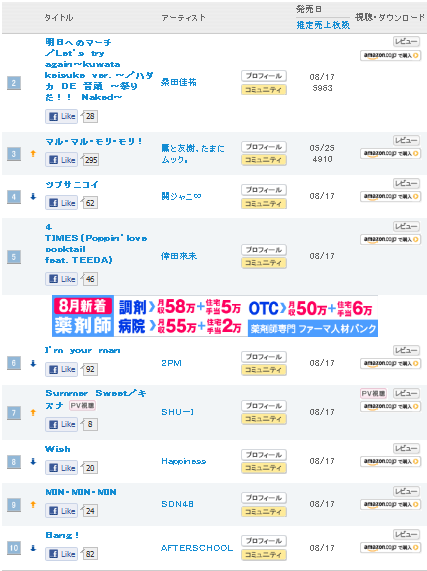 1 on Tower Record Japan rankings. The group appealed its masculine charms by wearing black suits and powerful choreography. They even sang live. From September 2 to 3, 2PM’s solo concert, 2PM Hands Up Asia Tour, begins at Jamsil Arena in Seoul. Q. What do you think about short girls? Q:: What would you say if you had to wake someone up? Q :: ในตอนเช้า ถ้าจะให้ปลุก จะพูดว่าอะไรเพื่อให้ตื่น? Q:: I am very shy of unfamiliar people, is there a solution? WY:: I'm like that either, but I'm trying to get over it now! I think a little bit more of courage will help you a lot. Q:: What would you do if you fell in love with someone at the first glance? JH:: It never happened to me before, but I think I'd try to become close with her. Q:: Your room still stinks? Q:: What do you think about girls who eat a lot? Check out th anthem below!! Billboard goes K-Pop today (Aug. 25) with the launch of a new chart, the Billboard K-Pop Hot 100. The tally, which ranks Korea's top-selling songs, kicks off with girl group Sistar's "So Cool" grabbing the No. 1 slot and beating out second-place Leesang and 2NE1, who land not only at No. 3 (with "Ugly") but also No. 14 ("Hate You") and No. 21 ("I Am The Best") on the chart dated Sept. 3. The Billboard K-Pop Hot 100 chart, launched in conjunction with Billboard Korea, is based on digital sales via leading websites as well as downloads from mobile service sites using an industry-standard formula and the most credible music data sources within Korea. The K-Pop Hot 100 debuts simultaneously here on Billboard.com, in the international chart section of Billboard.biz, in Billboard magazine, and also on Billboard Korea's website, billboard.co.kr. "The launch of the Billboard K-Pop Hot 100 chart is a milestone event, as it will provide the Korean music market with what we believe is Korea's most accurate and relevant song ranking," says Silvio Pietroluongo, Billboard's Director of Charts. "We're excited to be expanding Billboard's globally recognized Hot 100 chart franchise into this country, and look forward to enhancing the K-Pop Hot 100 chart in the near future with additional data as well as creating new charts that showcase the breadth of Korean music." Meanwhile the artists dominating the top of the inaugural Billboard K-Pop Hot 100 reflect the fact that hit-making girl groups are a top attraction in Korean music. Sistar and 2NE1 are just two examples. T-ara, made up of seven young ladies, has secured the No. 4 position as well as grabbing No. 73 (visit Billboard.biz soon for positions No. 51-100). Miss A, whose influential management company also manages the ever popular Wonder Girls, rounds out the top five with their single "Good-bye Baby." Here's a closer look at five of the female groups ruling the K-Pop 100 this week. In the inaugural week of the Kpop Hot 100 chart, both Homme and 2PM make it in the top 50! Homme comes in at #15 with "A Man Should Laugh" and 2PM comes in at #47 with "Hands Up"! Visit the chart HERE! On the 27th episode of cable station SBS E!TV’s 2PM Show, members of 2PM discuss the animals each of them could resemble. Kim Jun Su answers that he would be a tiger, and Taec Yeon says that he would be a cat. The rest of the members also give interesting answers. In the upcoming episode, 2PM plays various other games to show that good teamwork is a normal characteristic of their way of working together. They play games of table tennis, of using fans to keep balloons airborne for a given time, and more. The show will air on August 27 at 11:00 p.m. on SBS Plus channel, and at 12:00 p.m. on SBS E!TV. A picture capturing Nickhun and Jang Woo Young of 2PM and Jo Kwon of 2AM was revealed. On August 23, Nickhun tweeted, “You are my angel, I’ll try harder ♥” with a picture that he took with Jo Kwon and Jang Woo Young. In the picture, Jang Woo Young and Nickhun are standing on each side of Jo Kwon, lifting him in the air. The three are smiling brightly, and Nickhun and Jang Woo Young are making a heart for the fans. In response to Nickhun’s tweet, Jo Kwon replied, “No, I’ll try harder~” and Nickhun said, “No~ just one is enough ♥”. To Nickhun’s reply, Jo Kwon said, “Okay, then you go ahead and try harder♥” and gave a good laugh. The new edition of High Cut’s Volume 59 featured the tight-abs and tat-loving Jay Park (박재범) where he donned in simple and light outfits which focuses more on his attitude and tattoos. Jay also dyed his showed his new dye job and he looked amazing as a blonde. Guys, take a cue on how you can rocked blonde with simple outfits as being a blonde can be outstanding. Jay talked about his ink, being a fan boy of 2NE1, SBS’s Running Man and much more. This issue of High Cut would be out on stands on August 18th, so do grab it. After School starts this week at #10 , I'm not sure whether they closed the week of the debut at #6 or #8 because I've seen some reports saying they've fallen into #8 (and I bet those are from yesterday). However, the girls are falling slowly, I just wish they could pick up a couple of positions or keep in top 10 for one week more, but the trouble is the amount of new releases every week and the acts being already huge, like Koda Kumi, Kanjani 8, Kuwata Kei or SDN48. 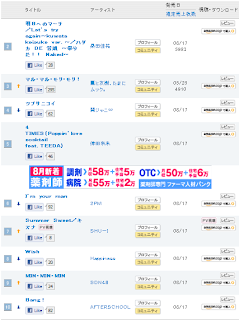 Kiss-My-Ft.2 just re-gained #1, while Kanjani8 descended from 1 to 4, 2PM is at 6,Hapinness went down till #8. SHU-I has also debuted and are picking up in the charts, right now they're at #7. The girls should be able to expand their now Japanese fanbase after a couple of a-nation, those gums selling, and the Hello Kitty collabo (though those won't come out until September)... shame the Coming Soon! Performance got cancelled. They will need more TV live performances (haven't done one yet) if they want to keep it up. On August 27 broadcast of the 2PM Show, members of 2PM play various games and displays good teamwork. The members show that they have exceptional teamwork among group members. They play a game of using fans to keep balloons airborne for a given time, a game of sending telepathy to write same answers to quizzes, and many more. 2PM Show airs every Saturday at 11:00 p.m on SBS Plus. [COLUMN] 110721 2PM Nichkhun's 'Seoul Diary' (1) - Feedback for 'Hands up'? "It's very fun and exciting right now"
A handsome singer, Nichkhun has the special ability to make everyone who meets him fall in love with his kindness and nice manners. Recently, 2PM has received lots of good feedback for their 2nd full length album "Hands Up." After releasing their latest song "Hands Up" on the 20th of last month, the song quickly became #1 on many charts, quickly showing their "10 out of 10" liveliness. The liveliness of 2PM is not constricted only in this country, but all over the world, and no doubt all over Asia. One of the 6 members is Nichkhun who is the only foreigner in the group who was born in Thailand, but now he has live in Korea for over 5 years and has already adapted to the language and food there. Since his debut, Nichkhun has been able to speak Thai (which for sure is his mother tongue), Korean, and English, and along with some Chinese. His story from the year 2006, from holding his dream to be a singer and his decision move to Korea to his evolution into "singer Nichkhun" kpop star of 2011 will start on the 21st in "Issue Daily" in "Nichkhun's Seoul Diary"
Nichkhun promises to tell his story sincerely in this "Seoul Diary," including the story of a little Thai boy who used to be fragile different from his body image who grows up to be a Hangul star who has become the interest of many people, his deep worries, his experiences in Korea, and his bright dreams. "Nichkhun's Seoul Diary" will start with a story about their most recent album and will have 10 parts. Hello, this is 2PM's Nichkhun. Please watch after me (smiles)." Nichkhun greeted reports with a friendly smile and now he will tell his story for 'Nichkhun's Seoul Diary." When asked to talk about his most recent album "Hands Up" a smile immediately came to his face, you can tell the pure happiness in his face reflects the popularity they are receiving now. "Because the song "Hands Up" is such a fun and energetic song, it really is nice to be having fun with our promotions, especially since our debut song "10 out of 10" most of our songs have been sad and gloomy, we are very lucky to have a fun that his lively and fresh and we're tired of the dark and gloomy environment (hahaha)"
Whether it is because they changed the mood from a dark to a more energtic one like Nichkhun said or not, the sales and feedback for this album is not normal. Like was said, they received many awards and topped many charts. Right now, 2PM has already won 5 trophies from TV music programs and they are just on their uphill part. "We didn't think that people would like it this much. Thank you like always for liking this song and for giving such positive feedback. We (2PM) are very happy and appreciative and we are able to do this because of everyone working together." Lastly, Nichkhun said to fans, jyp employees, and staff, "I would like to thank fans who have been by our sides since our debut, friends at JYPE who have strongly guided us through, and the staff, it's because of every single one of you that I am me today. Thank you. I will be a Nichkhun that won't disappoint you. Fighting." Please include everything on the credits when taking out. Q: What's your favorite Japanese word? Translated by rikakotsu @ JunkayStreet. Please take out with full credits & no hotlinking! 2PM recently met Japanese fans. On the 21st, 2PM held an event for the Japanese who bought their second single ‘I’m your man‘. Over 50 thousand fans attended the event. 2PM’s single ‘I’m your man‘ appeals their powerful image. When the member Taec Yeon said he is very happy to meet the fans, there was a big shout. Chan Sung also said it is a pleasure to meet them. 2PM is keeping busy attending ‘K-Pop All Star Live’ and ‘J-Wave Live 2000+11′ in Japan. JYP Entertainment, one of the leading Korean productions who 2PM and 2AM belong to, had their first-ever "JYP NATION" grand event in Japan entitled "JYP NATION in Japan 2011." This event was carried out at Saitama Super Arena on August 17 (Wed) & 18 (Thurs), starting with 2PM and representative J.Y. Park, there were also 2AM, Wonder Girls who are currently promoting in the US, LIM JEONG HEE, JOO, miss A, and San E, making a total of 8 artists and 23 people in all who performed, as well as a 13-man live musical band, and assembling an outstanding 24,000 member audience over the span of 2 days. The commemorating event started off with miss A for the opening. They splendidly collaborated with a Japanese wataiko (Japanese-style drum) performing group "Yamato" for "Goodbye Baby" and performed an acrobatic dance for "Breathe." 2AM, who are set to make their Japan debut in 2012, fascinated with their lovely harmonization for their representative track "Can't Let You Go Even If I Die." "We are really extremely super happy about debuting in Japan. Thank you everyone. We will continue to keep doing our best, so please look forward to our future Japan activities," they spoke of their joy for their debut, and the performances they showed after indeed made one anticipate their Japan activities. It was Wonder Girls' first live in Japan, and they excited the audience when they played their last song, their major Korean hit "Nobody," a surprise plan for the full-bodied audience. Then 2PM appeared onstage and started with the live performance of their 2nd single released on August 17, "I'm your man." The audience stood up in unison for "I'll Be Back," "Heartbeat," "Without U," and other performances. Along with the beautiful harmony that could be heard of LIM JEONG HEE, there were many mature, sensual and precise dance masterpieces performed by J.Y. Park and others that captivated the audience, and each artist performed their hit Korean tracks, representative tracks, and new songs, and 2PM and 2AM fascinated Saitama Super Arena with their first "One Day" performance ever in Japan. All artists got together for the final performance, and "JYP NATION in Japan 2011" came to a close after 42 songs in approximately 3 hours and 30 minutes. On the last day of the concert, it was hooked up in real-time to movie theaters nation-wide in Japan, and fans got to enjoy "JYP NATION in Japan 2011" as if they were really at the venue with the huge screen and quality sound system of the movie theater. "JYP NATION in Japan 2011"
In the picture, Nichkhun is wearing a pink shirt with pink arm warmers. He is smiling with his arms crossed just like Power Rangers. On the 17th 2PM has released the second single I’m Your Man in Japan and is actively giving performances. Nichkhun and Victoria recently went to Maldives for their summer vacation. In the pictures, Nichkhun and Victoria are having fun together. Victoria is wearing a white tube top dress. Both are currently appearing on MBC’s We Got Married. Nichkhun and Victoria’s summer vacation will air on the 20th (op: you can watch it here). JYP Entertainment artists -- namely Park Jin-young, Wonder Girls, 2PM, 2AM, San E, JOO, Lim Jeong-hee and miss A -- held their joint concert in Japan this week. On Friday, JYP Entertainment (JYPE) announced in a press release that a total of some 24,000 fans showed up for the JYP Nation in Japan concert which took place at the Saitama Super Arena on August 17 and 18. A PR official from JYPE told 10Asia over the phone that last night's performance was also shown in several movie theaters in the country for fans that were unable to make it to the concert. JYP Nation had previously performed at the Olympic Park Stadium for their Christmas Eve concert last year, attracting over 10,000 fans to the three-hour long show. They also collaborated on a Christmas carol titled "This Christmas" which fared well on various online music charts upon its release on December 1 last year. Founded in 1997 by famed singer and producer Park Jin-young, JYPE focuses on various aspects of the entertainment business including music production, new artist recruitment, training and management. The company is also famous for the successful music careers of many K-pop artists including Rain. 2PM’s Hwang Chan Sung talks of the release of their second album in Japan. In the picture, Hwang Chan Sung is holding the new album in one hand and makes a funny face. Behind him poses two other group members, Nickhun and Kim Jun Su, each wearing different comical expressions. Check out th funny CF below!